The NYS Tug Hill Commission is a small, non-regulatory state agency charged with “helping local governments and citizens shape the future of the Tug Hill region.” The Tug Hill region includes 41 towns and 18 villages in portions of Jefferson, Lewis, Oneida and Oswego counties. The most recent Regional Map is available for download. Learn more about the region and the commission in this video. The uniqueness of the Tug Hill region and its natural resources were recognized by New York State in 1972 when it created the commission. 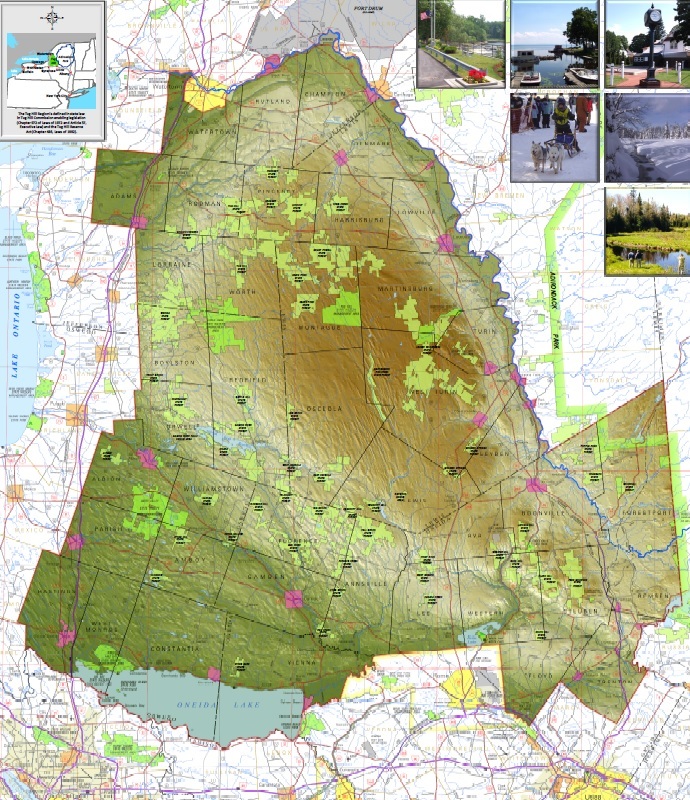 In 1992, the state legislature passed the Tug Hill Reserve Act, further recognizing the statewide importance of the region’s natural resources and in 1998 passed legislation encouraging the use of state-held conservation easements on key working forest lands. Through public meetings and surveys, local people have repeatedly told the commission they want to maintain what they treasure most about Tug Hill: clean water, healthy forests, productive farms, stable communities, and opportunities for hunting, fishing, and recreation. The commission works toward these goals by building the capacity of the region’s people to chart their own future. The commission’s programs and services are directed at strengthening local decision making, saving money through information sharing and training, and help in coordinating and raising funds for community improvement projects. The commission uses a grassroots approach to help create a sound environment and economy for this special, rural region of New York State. This is viewed by many as a model for fostering environmental protection and appropriate rural economic development in a way that retains “home rule” by local government. The commission provides local assistance to the region’s towns and villages and helps them with their day to day issues. This, in turn, leverages conservation and sustainable development that benefits the communities and state as a whole. The commission provides technical assistance to local governments, economic development organizations, and other local groups in land use planning, community development, and natural resource management. The commission also provides skill development and information for local officials through workshops and issue papers on various topics. The commission utilizes a model “circuit rider” program to serve the region’s five Councils of Government that, in effect, provides shared staff for most of the region’s towns and villages. A geographic information system (GIS) at the commission’s Watertown office provides support to and cuts costs for local governments, and increases town and village mapping and planning capacity through the use of GIS and emerging technologies.